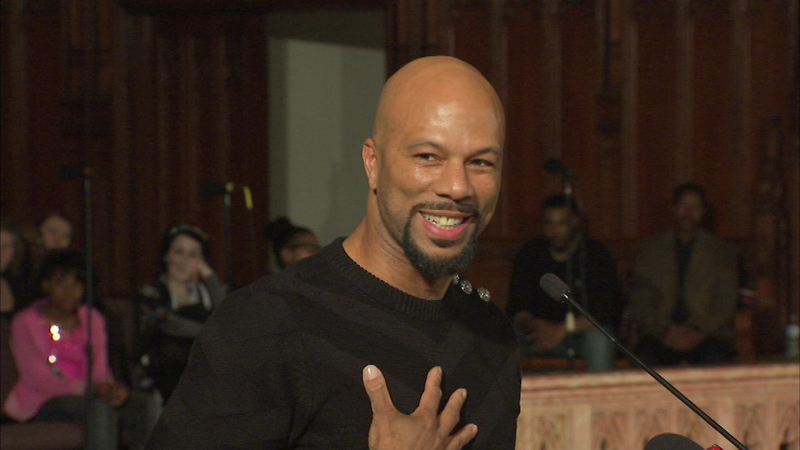 CHICAGO (WLS) -- Recent Academy Award-winner Common spoke at St. Sabina's African American lecturer's series Friday night at the church in Chicago's Auburn Gresham neighborhood. The Chicago native told ABC7 Eyewitness News that his recent recognition has helped his foundation's work. "To be able to effect children is one of the most important things to me, just in general, because I just feel it, that's where my passion is," he said. The hip-hop artist and actor co-wrote the song "Glory" for the movie "Selma." It won the Oscar for Best Original Song. Friday night, he had a message to young people attending the event. "When you really love something, it's not difficult to really work at it. If you want to be a service to your community, that's something you're passionate about," he said. He will hold a private fundraiser Saturday in Chicago benefiting the students of his Common Ground Foundation.